This post is a documentation of installation work with Yolanda Lopez related to forced eviction. In February 2014, I met Yolanda Lopez. I went to her home to film a cameo of her for the documentary Campfire: Eviction Stories from the Mission District, in which her son Rio Yañez narrates his family’s eviction. While introducing ourselves, we talked about the then upcoming 27th Annual Sólo Mujeres Exhibition: Home/Inside Out” at the Mission Cultural Center for Latino Arts. 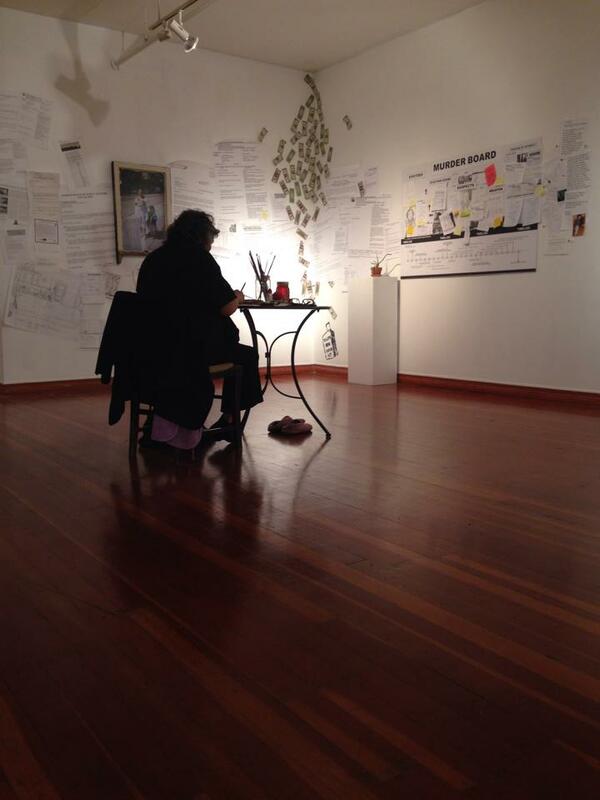 The show’s curators—Susana Aragón and Indira Urrutia—had separately encouraged us to submit work. The submission guidelines asked artists to adopt a metaphorical room in a home. We later met over hamburgers on Valencia and 24th Street, and made basic decisions for an installation. The room we chose was the artist workspace. Every home has a small workspace, even if it is the kitchen table. These are the corners in which projects are thought out and communicated. This is the room that the artists seek to reference in this show. The installation directly relates to the title of the Sólo Mujeres show “HOME/Inside Out” by representing the violation of an intimate and creative artist workspace by the legal process of a no-fault eviction, and other legal acts of landlord harassment. The installation aims to immerse the viewer into a layered experience of eviction. The fragility of home vis-a-vis real estate speculation is an evident theme. Less evident is the intense stress that intoxicates an evictee, particularly elders ousted from lifelong lairs. The eviction of an elder is also representative of shifting community values in the Mission. Are elders no longer respected in the Mission? Are grandmothers and grandfathers no longer welcome here? Children and their families are living away from their elders, aunties, uncles, cousins, and other supportive family members. Is generational and family diaspora the new Mission statement? Sketch by A. Camarena. Submitted with proposal for “Work Space: An Ellis Act Installation” to Sólo Mujeres. In 1979, Lopez and then partner René Yañez amicably separated. She moved out of 380 San Jose-#3 and across the hall into #4 with her son Rio. Rio was raised in proximity to both his parents. 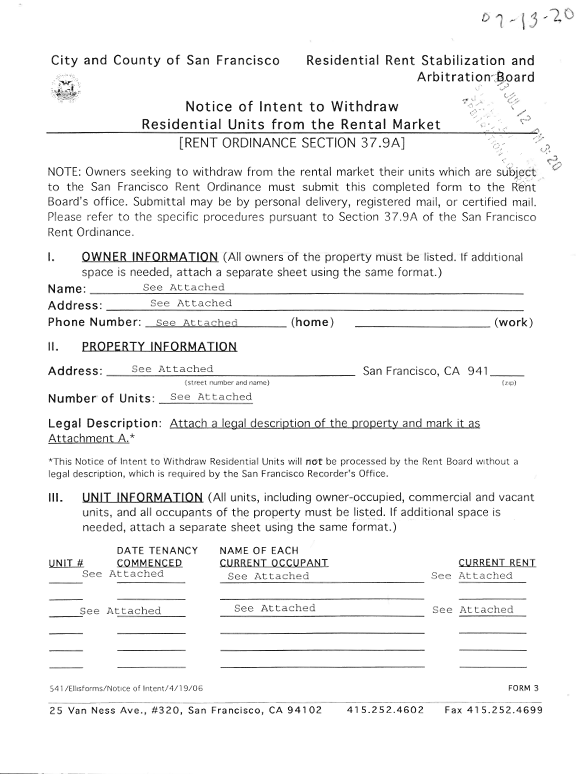 Thirty-four years later, on July 12, 2013, all inhabitants in the building’s four apartments received an Ellis Act Eviction Notice (see Notice of Intent to Withdraw Residential Units from the Rental Market.) Lopez and several other senior tenants had a year to leave under the law. The looming deadline was July 12, 2014. The technology business in the Bay Area is booming. Technology companies are granted incentives to move to San Francisco, such as the 2011 Twitter Tax Break and Tech Bus Shuttle programs. These incentives are orchestrated at City Hall by the Mayor, developers, and tech leadership. Real estate speculators “sell” neighborhoods with a sense of place to young professionals working at tech companies. (These professionals are often referred to as “techies”.) Techies earn high salaries, with an average annual salary in 2013 of $108,603. Real estate speculators know that techies are willing to pay “sucker rent prices” to move into a neighborhood marketed as hip. 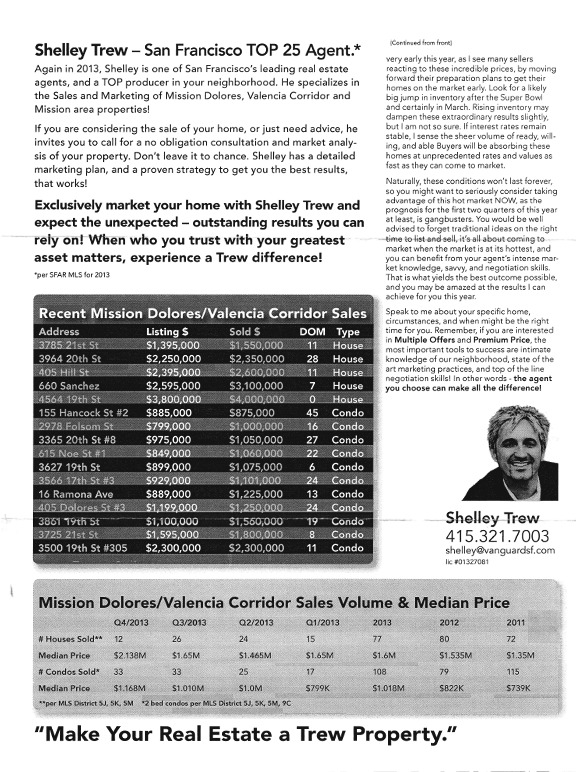 The Mission is promoted as “hip” by real estate speculators because of its sense of place. What is the sense of place? The Mission’s sense of place has been crafted over more than half a century by immigrant and working-class, predominantly Latino families, who have overlapped with low-income artists, activists, and their movements in this geographic space. Lopez is an artist, social justice worker, Latina, feminist, and a community elder, who significantly influenced the sense of place of the Mission over a lifetime of work in its streets and institutions, sometimes as an employee, other times as an artist, teacher, or activist, while embracing the life of a single mother. San Francisco has a long history of housing movements that resulted in regulations to protect tenants, such as rent control and prohibiting no-fault evictions for speculative reasons. Because of these regulations real estate speculators use a California State Law (aka the Ellis Act) to clear out low-income tenants from “hot” properties. Yolanda’s apartment building at 380 San José has been kept under near slum conditions by Sergio Iantorno, as proven by the multiple and I mean multiple Building Inspection Notices given to him. However, now that the building is surrounded by shuttle bus stops used by the top tech companies in Silicon Valley, this building is nearly on fire, it is considered so “hot”! Each time a speculator removes a property from the rental market by using the Ellis Act, they are removing existing affordable housing for low-income residents of San Francisco. They are also forcing them into communities where they have few or no ties, or to scramble for meager public housing resources in the City. This may be legal, but it is not just. 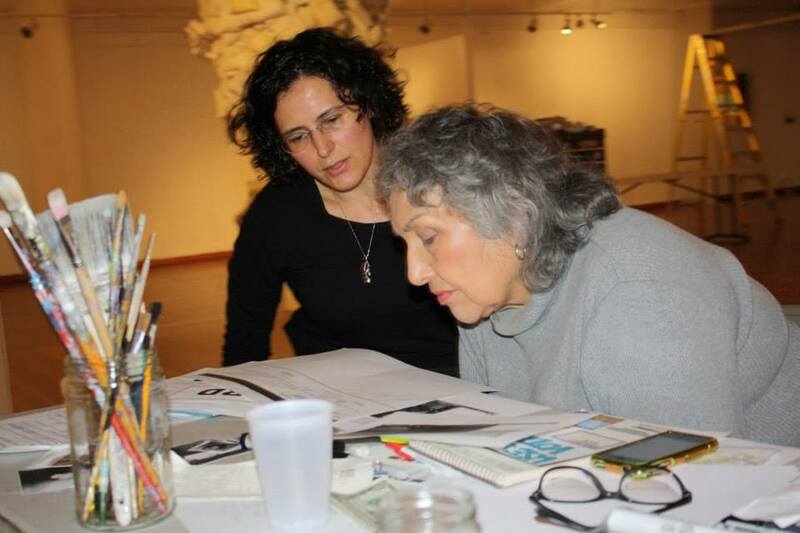 During the process of designing the installation, Yolanda spoke to her friend Judy Drummond about a problem we were having for exposing the responsible parties in the midst of the layers of eviction papers. Judy suggested that we use a “murder board,” like those used in Castle or Criminal Minds, to visually pinpoint the responsible parties in the eviction. Suddenly, we had a crime scene on our hands, and a way to clearly depict Evictees, Eviction Scene, Weapon, Suspects, Other Persons of Interest, and Outstanding Questions. 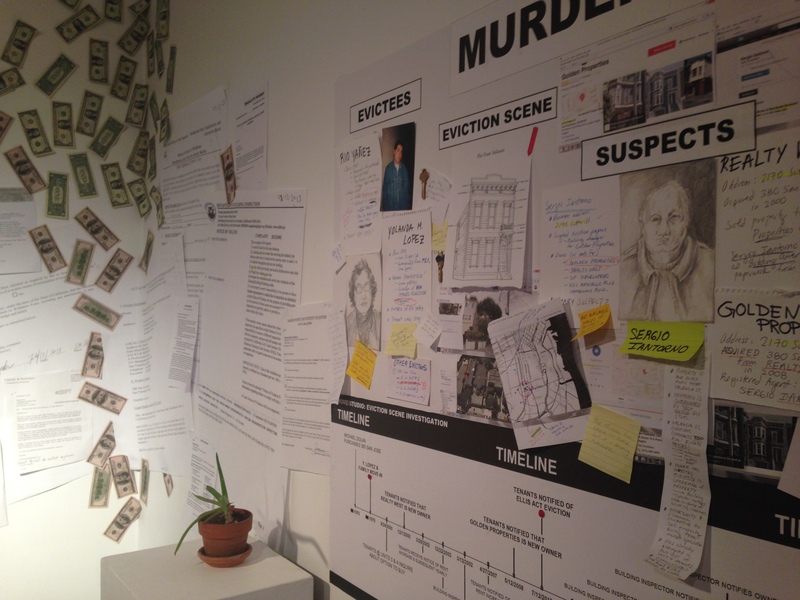 While Yolanda directed the overall flow and placement of the pieces, I started arranging the “murder board” collage. We agreed to add audio to the piece to emphasize the murder mystery story. Rio gave us some feedback on what worked best in the audio segments are proposed. During the two weeks leading up to the opening of Sólo Mujeres, we met almost every afternoon for about four to six hours. Yolanda is a night owl, and I am not an early riser. We work afternoons to evening. During the course of setting up the installation, we shared meals and coffee; expenses and time; and told each other summarized versions of our personal life stories. We got irritated with each other at times, and still met next day to continue final touches. We dove into this arrangement as strangers. Evictions are intimate and dire. 71 year old Yolanda shows grit during the installation set-up; we will expose them. She breaks down crying only once over a photo of Río as a teenager, but concludes a sketch from this image for the murder board. 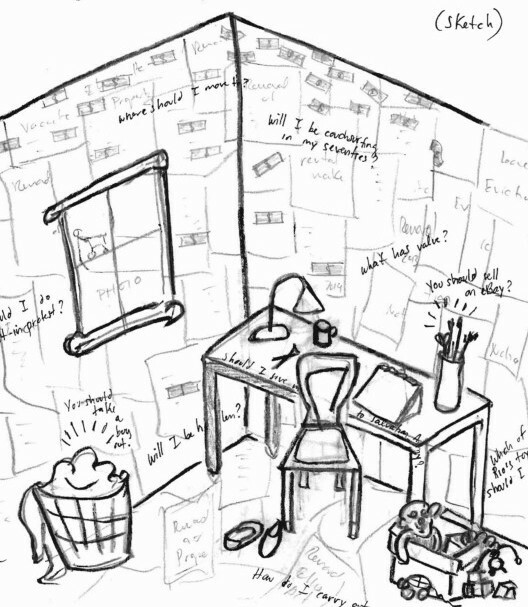 A meticulous artist, Yolanda spent hours considering each enlarged copy of the eviction papers and every other paper at hand for a final decision about what to use to tell her story. In her mind’s eye, she already knew how the money should trickle down. Standing on the ladder with an industrial stapler, I place dollar bills under instruction to hit the angles she wants. We debate the image for the window frame, and after looking at various possible prints, we settle on a photo that I took in 2013 of a dignified young Mission madre standing on Mission Street with her two children. I fade the photo, making it hard to date. Many visitors to the exhibit believe that this woman is Yolanda. For Yolanda, the woman represented throughout the installation is a mere character: She is every evicted Latina mother of the Mission. She is every evicted elder. She is every homegirl and artist of the Mission who cannot afford to live here anymore. By the end of the process, we were both exhausted. The opening night of Sólo Mujeres we were per habit tardy, but we arrived to enjoy visitors pondering the exhibit. Next, Yolanda Lopez collaborated with her son Rio Yañez on creating a performance garage sale titled “Accessories to an Eviction”, in which they sold precious items that needed to be let go due to their looming eviction date. The first garage sale took place in collaboration with La Galería de la Raza staff and with support from Angelica Rodriguez, Indira Urrutia and Adriana Camarena in May 2014. A second garage sale took place in collaboration with the Red Poppy Art House in June 2014 with support from Angelica Rodriguez, Indira Urrutia, and Adriana Camarena. Facebook event pages were created to promote the Accessories to an Eviction performance garage sale. By developing promotional event pages on a social media platform (one of the sources of the wealth generating the conditions of eviction for Yolanda in that specific desired shuttle bus corrido) we further peddled a market scene in which purchasers were incidentally made accessories to Yolanda and Rio’s eviction, even though their intent was one of support. May 3-4, 2014 Event documentation: A facebook page was established for the first garage sale. Camarena and other collaborators documented the garage sale online. June 7, 2014 Event documentation: Camarena co-managed the event page and documented images of the sale on Facebook. Camarena purchased from Lopez two ceramic teapots shaped like sewing machines. These teapots were given as a gift to Lopez by an art critic who helped Lopez gain recognition as an early Chicana artist. Camarena treasures these teapots, none the less for buying them from Lopez at her eviction garage sale. “Eviction Scene Investigation” was once again installed at the Red Poppy Art House to accompany the second “Accessories to an Eviction” garage sale. Camarena photographed the installation. Yolanda M. Lopez is an O.G. artist and social justice organizer, brilliant thinker, decisive, a role model, a mentor. A 71 year old boss. Yolanda calls me necia, when I think she is being a necia (a stubborn person). We test each other’s patience. But in the end, we remain grateful amigas. I admire Yolanda for having firm opinions. I expected to end this blog post with documentation of the final installation of “Home/Studio: Eviction Scene Investigation (Lopez & Camarena) on the “Democracy Wall” on Valencia Street between 23rd and 24th, on the date of Yolanda’s eviction date set for July. That was a plan we had discussed for a final installation. Instead one more month of fighting the eviction became two and then three and then four, etc. A year later in August 2015, the San Francisco Community Land Trust and the Mission Economic Development Agency with a loan from the City’s Small Sites Fund purchased Yolanda’s building, establishing permanent affordable housing for her, her neighbors, and in the City forever. Buildings bought by the land trust are taken permanently off the speculative real estate market. Two months earlier, my building, the Pigeon Palace had been similarly purchased by the San Francisco Community Land Trust with a City small sites loan as well, giving me and my neighbors the right to permanently stay in San Francisco with cheap rent. It’s a story for another day, but I do want to share one detail about how we evaded eviction: In a miraculous hail mary last bid in an open probate court sale, the San Francisco Community Land Trust out bid Sergio Iantorno for the purchase of our building. If you are wondering how it was all possible for me and my neighbors or Yolanda and her neighbors, the answer is simple: We organized. Previous PostMy Mission Blood: Tales From The Block!